On Saturday morning I will be headed down to Des Moines for the Iowa State Fair. This is the reason for the absence of a blog post for quite some time now. The show string has come together nicely and hopefully will do well in the show… I guess you will find out how they do next week as I will be sure to post the results ASAP. Very excited to see all of my fellow Iowa Hereford breeders and maybe even more excited to see their cattle! Each year this show seems to grow and with that growth the level of competition is also on the rise. Last week I got all of the calves weaned besides the June calf and all are doing well. The pictures of the calves will be coming after the fair as well! The only photo that I have to share with this post is one of Legacy when he was getting ready to be loaded to head back down south! As a young cattlemen on of the most frustrating things to deal with is peoples doubt in my ability. This may not be the case for others who grew-up in a cattle operation, but for me it is seemingly a daily deal. In the hustle to try to “prove” myself I think I might start to distrust others expertise. Wow, what a beautiful Iowa morning it is! Calves are all fed and the creep feeder is full. Everything looks good other then the amount of air in Ceci’s stomach this morning… Nothing a little mineral oil won’t take care of! And if you haven’t or don’t use mineral oil to get rid of bloat you should stuff works great and as long as their stomach isn’t too messed up from the bloat they will kick back on feed and never look back but if you question it sometimes I will give them a sulfa bolus and maybe some kao and they are fine. (disclaimer I am not a certified vet and sometimes not even a certified cattlemen so use advise with caution hahaha) But all in all a good morning with clear eyes on the calves and full bellies… progress continues. Tonight I will start tying up the bull calves as I put halters on last night… Always an exciting time. I will leave you this morning with a picture of Medusa hanging out with her mom taken this morning. We continue to inch closer and closer to the upcoming Iowa State Fair each year this is my biggest event and the one that I look forward to the most. This year I have registered a heifer and two bulls but I’m not sure if the bulls will make the cut… I guess time will tell. 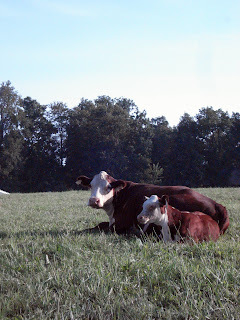 I am also currently kicking myself for not entering my January heifers that I purchased with their mamma’s from Star Lake… there is always next year! We had a ton of rain last week and the made everything at the farm a mud hole and almost impossible to keep the cattle clean so the rinsing has been put to a halt. Most everything else is going well all things considered. I will wean the remaining calves shortly after or right after I pull the bulls on the 9th and that will once again increase the excitement level on the farm! 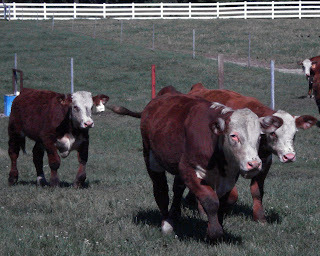 Welp that is all for this post other then this cool picture of a few of the weaned bull calves walking to the bunk. I’ll start this off with a few pictures! 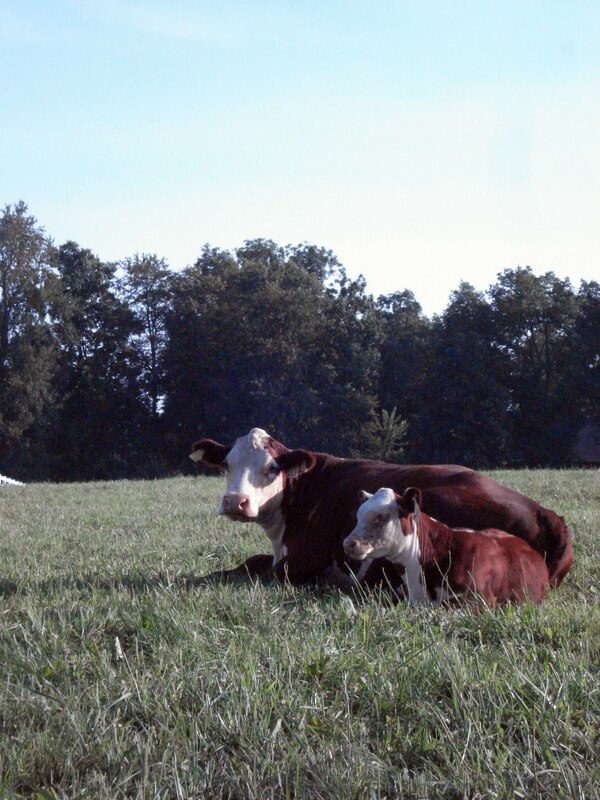 Here are a few pictures that I took today at the farm… The place has really started to shine lately with both the cattle and the farm really thriving. Hope you like what you see… will post some more as progress continues. G.R.I.N.D on the left and Cash on the right think it’s time to get some feed… too bad it was even close to time!